A CHARMING morning was that of the 13th of September. Early autumn so revealed herself, that she could be mistaken for no other season of the year. In beads, the dew was on the grass. Through a tender grey mist, the sun shed a ray-less light. Anon, it edged the clouds with a dazzling glory. On coming forth, it glinted, rather than shone, with the steady glare of summer. The glint was on the leaves, over the great turnip field, between the dark furrows. In shadow, the fences and the corn stooks fell far across the stubble. In shadow, the sedges trembled in the pools. A freshening wind chased the water into silver-tipped ripples, ever and anon darkened by the veiling of the sun. The meet was at a quaint mill. Old enough to be picturesque, it was called the new mill. Like most of us, it was younger when christened. In the yard, the field—more than half ladies, fresh as morning, and fitly toileted—were pleasantly grouped around the dogs. The red coat of the huntsman gave a touch of colour. The hounds were a somewhat mixed lot. From the low setting, self-colour, shaggy hair, and long pendent ears, one at least was an otter hound; he was the noblest and most interesting. The slouch, greater height on the legs, and lakes of colour revealed the strain of the foxhound. Some three or four were Welsh. I had a chat with the huntsman. By the way, he was characteristic, with no superfluous height nor flesh; dry-mannered, civil-tongued, a master of his craft, with an eye on his charge, while he answered a question. Such an one as it would be interesting, on the evening of a kill, to hear singing, "We all went a ‘untin’ to-day." His experience was that the otter-hound is wanting in stamina. It is so with other more or less pure strains — the deerhound, for instance. "That one has any amount of stay in him." And he pointed to a dog with the colour patches of a foxhound ancestry. Perhaps the crosses are not so loyal to the craft, and need the crack of the whip to keep them at the work. There was a tendency to shirk, and slip out of sight, in the undergrowth, not seen in the otter-hound. The field went down by the mill-race. 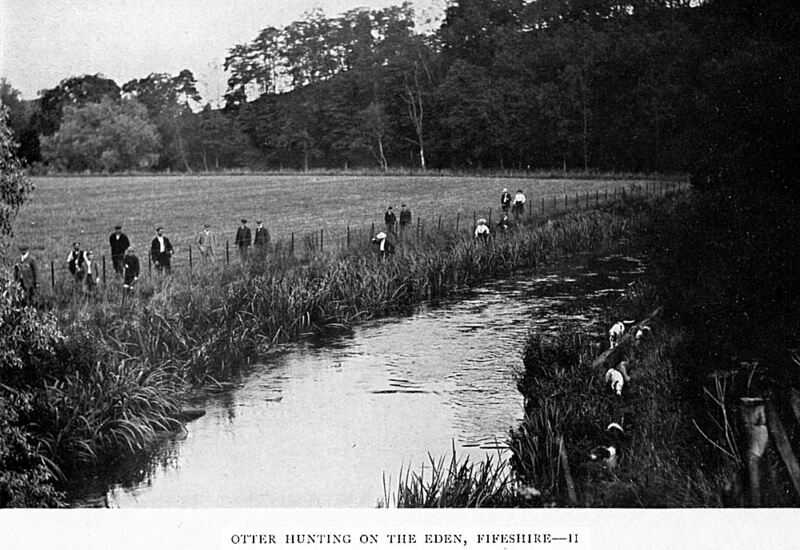 The hunt kept away round the bed of the stream; all day it followed the natural channel, even when almost dry, from the water being diverted, to one or other of the many mills. The hounds scattered to their work, each acting for itself, and along with the rest. Little crowding or overlapping was there. Some kept on the grass, to pick up the scent of any otter that may have come up that way, from its favourite fishing-ground, in the early morning. One swam under the far bank, brushing the long floating grasses, and plashing through many sedges. While heads showed above water, ploughing the pool to reach the hither side. When the long silence told no tales, and the lack of events was blunting the keenness of the hounds, the huntsman’s horn brought the pack together. No hiding-place so cunning as to escape their search: the noses were everywhere. The unrehearsed incidents of the hunt were interesting. Ousted from her moist retreat, the water-hen rose heavily, and, with trailing, dripping legs, passed over the water. On the ridge behind, scurrying rabbits were silhouetted against the sky. To the imagination was left, to picture the confusion of startled trout underneath. Beyond the meeting of the waters, the full stream entered beneath the trees. The next half-mile was den. A den is a narrow strath, where the banks sharply, sometimes abruptly, slope, and are more or less wooded. No den can be more delightful than those of the Eden. Nor any Eden den than this. Broken by protruding roots, the path wound in and out among the trees. Through the foliage, the field looked down upon the hunt. To know the full meaning of that, one needed to be there. The leaves trembled in the fresh breeze, which found a free passage down the avenued stream path. Filtering from above, the pure September sunlight edged each leaf with the brilliance which margins a cloud. All together moved on the face of the waters, chasing the still pool into light and shadow, and making the current doubly charming, in its double ripple. And in this fairyland—which, happily, one does not need to go from earth to see, but only out of the highway—the drama was being en-acted. 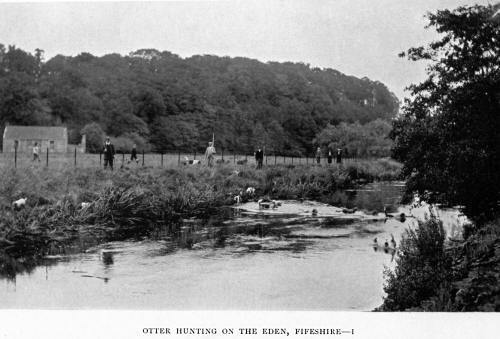 In these still, yet trembling pools, in the currents which pass along under the trees with a double motion, the hounds swam, startling the water-hen amid the glorified sedges; while the red-coated huntsman stood knee-deep, or to the gilt buttons on his back, sometimes tooting the horn, with its strange sporting note. Some of the groupings in this environment were pictures. All of them, in fact, since the scenes made them so. Common indeed musti that have been which did not seem uncommon. Little knots of interested lookers-on, from the4 rude woodland pathway, peered through leaves at the light and shadow playing on pool and., current, over the hounds. I care not what brought them there, or what they saw, they would not go away quite the same. However opaque the outside, the leaves must have trembled through on to the spirit. For once in their lives, and from the point of view of the hunts-man in the stream, they themselves were pictures. One slight girl was busy with a hand camera of the most modest dimensions. I hope she was successful, though I am afraid not, since some of the way was too shaded for such instantaneous work. If she sees this, she will learn how I envied her even her toy. The faintest blurred presentment would still have been worth having. Though nothing may give back the infinite freshness of morning in the woods, when the shadows are actually playing on a scene instinct with drama. In two main fretting currents, the water parted round a rough islet. It is a stream of islets because a stream of mills. These islets seem born of the unequal flow over the dam. This might be known as the islet of the wood. Half a dozen brawling streamlets broke it up into so many pieces. Huge boulders strove to keep their heads above the long grasses and storm-rent bushes. In the rude channels and through the rank growths, hounds appeared and vanished. From the vantage of a stranded trunk, the master watched and directed. Over all, the lights and shadows played with a bewildering complexity and charm. A ripple of excitement passed over the field. The hounds were speaking out. The voice of the otter-hound played with a drum-like beat on the heart. It was in sympathy with the scene: the note of the streamside chase. A hound with a deeper, more bell-like note had been left in the kennel for the day. The music of the crosses was harshened into a prolonged bark. A hot darg was followed to a culvert or mouth of a drain. No darg led away. The otter had entered and had not come out. A spade appeared on the scene. The drain led too far back, and the quarry sat tight. The hunt turned up stream. Miles were covered, away to the haunts of the water vole. Nothing more appeared. At mid-day the dogs were drawn off. "The fact is, there ain’t so many otters as they talk about, or they’d have left the mark of their feet or some at behind them on the stones." Such was the huntsman’s comment. "It ain’t the dogs’ fault." That was his grievance; to see his charge turning tail on a bloodless hunt. So far he was right; the dogs did well. Perhaps he was unjust to the stream and the quarry. It was an otter’s day, and none the less pleasant on that account. The wit which eludes is quite as interesting as that which overcomes. Together they make sport. The hunt came not within sight of a tragic close. The eighteenth differed, as one charming autumn morning differs from another. Typical of September, both were woven of filmy threads to like delightful issues. Low down on the eastern horizon, a crimson haze told of the lately risen sun. A cool moist touch was in the still air. More than half the sky was mackerel-scaled, hinting at a possible freshening as the day went on. The grey of the stubble passed into the purple-shadowed ridge to the south. The northern sky was of a cold forget-me-not blue, and over the pasture was a grey-blue light, with a touch of the pearl of dawn. Far down, in the broader reaches of the stream, by tidal waters, common to the otter and the seal, was the start. Though passing from the richly-wooded inland to the treeless and sandy estuary, the scene had attraction of its own. We dropped down through the pasture field, with the eager hounds on in front, under the eye of master and huntsman. The course of the stream might be traced, on either hand, in a sinuous line, marked by the bank-enriching waters, somewhat checked, perhaps, by the kiss of the tide. Working men were spending the week end— Monday being a holiday—with the rod. Four full-grown fishers, and among them but a little tent. Questioned as to how they managed to sleep, where was only room enough for one—"One at a time," was the answer. The stockinged legs of the man in possession protruded from the opening. Dark was the busy time. Fishing was all night long. At this early hour of the morning, the baskets were fairly well stocked. In the shortening autumn twilight, the rise set in and sport began. Sea trout abounded. Nor had they it all to themselves. Other, and still keener night fishers, were there. For fellow-sportsmen they had three otters, almost as many as the men. This was hopeful, and no less hopeful than true. Soon the hounds found where the otters had been on the bank. The music sounded. And a hot darg led up the tidal waters. It was exhilarating to hear the streamside music, to feel the ringing in the heart. The deeper bell tones showed that the old dog had joined the pack. A like bell, only higher pitched, rang in the throat of the second hound. The crosses’ bark was prolonged into a howl. The camera was present, only the hour was early, the light grey, the scene shaded, and the presentment dim. Over a loose and decayed dam of stones the stream broke, spreading into a charming waterscape, and parting to isolate a piece of land. Islet and shimmering pool were set in a high bank with a semicircular sweep of white willows. Through the maze ran or swam the dogs. In the midst stood the red-coated huntsman. The otter had retired up one or other of two culverts, where nothing could reach him. Nydie dam checks at once the upcoming tide and the down-running stream. It is the meeting-place of otter and seal, though the former goes among the sea trout. The curving in the still deep stretch of checked fresh water is striking. The loops, in three or four parallel lines, almost touch, and by a little more fretting of the banks would merge. Two skiffs might sail separated by a neck of land, over which a biscuit could be tossed. It is a miniature of the winding of the Forth below Stirling. Round the loops the hunt wound its picturesque way. And as it moved the scene became increasingly richer. Trees gathered to the water-side, now narrowing the horizon to the single pool which the dogs were working, again opening leafy vistas, charming bends, or glimpses of autumn fields. Through much of this stream-land passed the hunt, without a note from the hounds. Freed from the strain of dramatic incident, the field might yield to the environment. So we came to where the Ceres burn enters the Eden. A veteran, who had lived much by the streamside, had many tales to tell, bearing on the doings of the day; there be fish tales and Otter tales. Two had sat, one on either side of him as he plied the rod, while a third balanced itself on the floating weeds. One wondered if the three were water voles. Soon the dogs picked up the scent. The veteran was avenged of the sceptics. The environment was forgotten, the drama was everything. The darg led to an islet; of all we had seen, the most capable of a prolonged siege. On the main bend were deep overhanging banks, with gnarled old trunks hollowed out by age and storm. Breast high, flapped the great rhubarb-like leaves of the butterbur. The water was low. From the far side, beyond the leaves, the huntsman "Tally-ho-ed." There the lesser limb of the stream hugged the base of a steep bank, and had fretted a long tunnel, whose roof was bound by the spreading tree roots. The darg was hot indeed. The bell-notes of the otter-hounds rang through the prolonged howl of the crosses. Over the islet, hidden by the big leaves, careered the hunt. "Tally-ho! he has just passed me, and a big dog-otter too." "Tally-ho!" cried one of the anglers who had joined the hunt, as a dark form vanished amid the climbing woodbine and rank herbage around the base of a great trunk at the lower part of the island. "Tally-ho!" came in a lady’s clear treble, as he showed his nose above the muddied water of the larger limb of the stream. Perhaps I am too fastidious. But is it quite fair, in a contest between dog and otter, for the field—who place themselves well-nigh at every point of vantage, and are, at best, only accidents of the hunt—to tell the whereabouts of the pursued? It is much as though the looker-on at a children’s game of hide-and-seek told where the hider was. All the wild animal was loose in the dog, all the savage in man and woman. One who heard from the distance said it was the howl of a menagerie. There came a lull. Busy but silent, the dogs crossed among the great elephant-eared leaves, swam in the muddied bend of the stream, plashing through the sedges, and nosing under the tree roots. The sporting toot of the horn called them back to the tunnel in the far bend whence they started. "Piper," one of the wiry-haired terriers, started on a little hunt of his own. His restless energies wanted employment, which his nimble wits found. It was like the clown amid the serious business of the ring. He was after a water-hen. Undaunted by the unequal match of legs against wings, he dogged its heavy flight, marked where it lit among the sedges or crept up through the tall grass. And finally, came down with it in his mouth. "Tally ho!" That bell-like note again, that drumstroke on the heart. The smile on the faces changed to another look. The terrier dropped his game. The water-hen hobbled painfully off with a broken wing, to play another part later on. Bedlam once more broke loose. Through the great elephant-eared leaves careered the hunt, howling as it went. Again the dark form vanished by the woodbine-cushioned trunk at the lower end of the island. It reappeared. The hounds were hard upon it. Almost together they reached where the two branches of the stream meet at a shallowing or ford. They rolled and splashed in a heap. The dogs were uppermost. It was a kill. The otter slid from under into the deep water. The music subsided, but not the strain. Outlook and expectation were alike tense: conditions under which anything may happen. One excited old party seemed to have lost his wits. "There, there! Tally ho! Tally ho!" His eyes were starting; but that he was bald, his hat would have risen on his head. The field gathered round, eagerly watching the wagging and pointing finger. "A blessed water-hen!" cried the hunts-man drily. Piper’s catch was crawling up the bank. "Who Tallied?" came the stern challenge from the master. The culprit’s eyes were fixed upon his boots; he was markedly silent for the rest of the hunt. "Three of you were at it together, in different parts of the field." So it was. The intoxication was general. Men saw visions. There was reason for protest. It was unfair to the huntsman, the master, the dogs; it drew them away from their proper work. It made of the hunt a sort of general thing, a farce. The way to put it down is to say, "Now, ladies and gentlemen, you will understand that this is a matter between the dogs and the otter." Almost a hounds’ day that in which the quarry was rolled over. Well-nigh a tragedy, and would have been wholly one, but for an ally that came to the otter’s aid. The muddied stream crept up the sedge blades and floated out the higher grasses. Some of the mills had opened the sluice, and set free the pent water of the dam. And so the holes under the tree-roots were sealed from the dogs. Perhaps the hunt is at its best so, with all the excitement of a chase without the satiety of a kill.